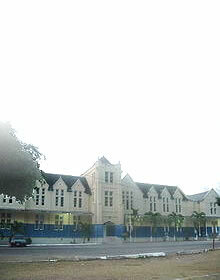 The property at number one King Street and the corner of Market Street, Montego Bay, St. James was formerly the Manse of the Burchell Baptist Church. The Church was named after the renowned Baptist Missionary and pioneer Thomas Burchell. 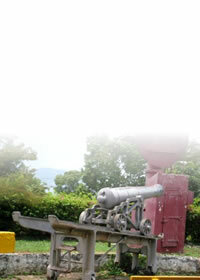 He did most of his pioneering actions in the western parishes of the island. Thomas Burchell lived in the Manse, while he worked in the parish of St. James. 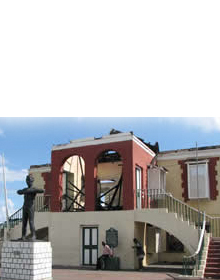 Built along the Jamaica Georgian lines of architecture, the Old Baptist Manse depicts the transition of European design being adapted to the tropical environment. This two-storey structure has a double mansard gable roof; with a wide trough galvanize zinc sheet finish. Punctuating each gabled end, are fixed louvre arched windows for ventilation and to some extent illumination. The first floor level boasts a series of six panel sash windows all fitted in a wooden frame. The walls at the first floor of the building are constructed of wooden cladding, which terminates at the belt beam level of the roof. The walls at the ground floor are constructed of brick, and a series of sash windows are replicated in a symmetrical pattern at both levels. The entrance elevation, boasts an arcade with wooden Doric columns. The first level has an elaborate piazza, with balustrades highlighting an intricate lattice design.